DDOT reports at 295 Southbound there’s a two vehicle accident with injuries all lanes are block at this time and all on coming traffic is Being rerouted on to East Capitol St. If I were grading this in English class, I’d mark seven problems with this short message. Can you find them? Parking is at a premium in D.C.’s busy Georgetown shopping district, so the local Chevy Chase Bank posts clear and reasonable restrictions on the parking available for its customers. Oh…the car parked behind the sign? That’s an official vehicle from the Parking Enforcement division of the District of Columbia’s Department of Public Works. It’s parked there. 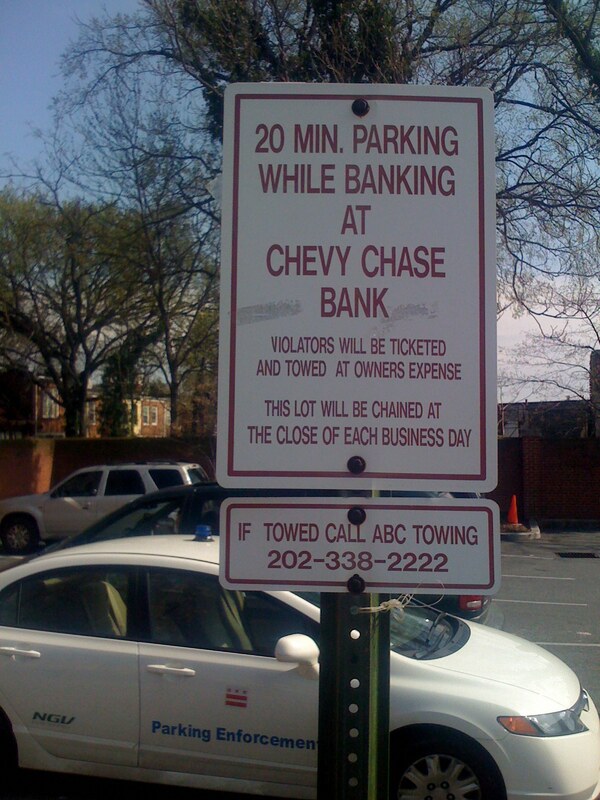 And the bank was closed at the time this picture was taken, so…it seems unlikely that the parking enforcement officer was “banking at Chevy Chase Bank.” It seems more likely that the parking enforcement officer was violating Chevy Chase’s parking policy by using this private lot rather than seeking out oh-so-hard-to-find legal street parking in Georgetown. Precious, isn’t it? Neither the From Address or the Subject give me a clue as to what this message is when I scan through my e-mail inbox. With all of the spam once receives these days, you should do everything possible to ensure that the recipients of these messages don’t inadvertently delete them just because they don’t recognize the sender or the subject matter. Specifically, with regard to the From address, the sender’s email address: I have no idea whatsoever who imailagent is. Why would I? Why should I? It isn’t even as if this is simply an unrecognizable e-mail address—it’s the supposedly friendly display name of the sender’s e-mail address. This is the part of the name that you actually get to define. Suggestion: Change the name of the sender, the display name in the FROM address for each message, to DC Customer Service. Specifically, with regard to the Subject: What is EOM? What is Intranet Quorum? Why would I care? Why should I care? The message Subject here baffles me. It doesn’t help me understand what this message is about. It’s worth noting that the message itself doesn’t ever define EOM or Intranet Quorum—and it shouldn’t have to because those terms shouldn’t even be in the Subject or the message. They’re not useful or important to me, the message recipient. The number in the Subject line is equally useless to the recipient. I initially assumed that it’s a tracking number for my request, but reading further into the message reveals that it is not. My request has a tracking number assigned to it that, in fact, is not the same as the “IMA” number in the Subject. Strange. Suggestion: Change the Subject for each message to something more useful. In this particular case, that could be Acknowledgement of service request #475602. One more thing I notice before even opening the message: it has an attachment. With the many concerns about e-mail viruses spread by attachments, I would assert that sending an attachment in a message that the recipient doesn’t recognize is unwise. It might further encourage the recipient to discard the message without even opening it. Being both curious and careful, however, I first scanned the message attachment for viruses and then opened the message. To my bewilderment, the attachment is simply a text file that contains some XML with very basic metadata. I’m unsure why this attachment is included with the message that I received. At first I thought that perhaps it helps your automated system track any further correspondence on this request, but if I reply to the message I received, the file will no longer be attached to my response. So…why is this here? Suggestion: Do not include this attachment on the message that you send to the person who initiated the service request. The first piece of information in the message is a date. It is today’s date. This is helpful, I suppose, except that the date of the e-mail message itself gives me the same information. What would be more helpful is the date that I made the request—especially since this acknowledgement comes to me several days after making that request. Suggestion: Replace the correspondence date in the message with the (clearly labeled) request date. Thank you for writing to Mayor Anthony Williams. We appreciate your comments and care about your concerns. This acknowledgement is in reference to your recent email. Your request has been forwarded to [Jane Doe], the Mayor’s point-of-contact at the . Please feel free to contact that office at [(999) 999-9999] or [e-mail address] regarding the status of your request. The message states, “Your request has been forwarded to [Jane Doe], the Mayor’s point-of-contact at the .” Yes, that last sentence is missing…something. Is it “Office of the Chief Technology Officer?” Is it something else? Suggestion: Fill in the blank. Your correspondence has been assigned the following EOM tracking number: 475602. Please refer to this number when referencing this request. If you receive no contact or reply from the agency within 5 business days, please call (202) 727-1000. Give them the contact’s name, office, and tracking number and ask for a point-of-contact follow-up. For future correspondence with the Mayor or to submit your e-mail address for his database, please write to mayor@dc.gov. Nowhere in the message is there any reference to my actual request. Nowhere. It doesn’t mention the request date, the request itself, or even the “Subject” that you required me to select when I completed the online feedback form. Suppose that I made a few requests over the past few days. Suppose that I made multiple requests on that same day. How would I know which acknowledgement corresponds with which request? I would not. Why not include the original request in the response? This would be extremely helpful for some context. Especially since the sender could have initiated multiple requests. Believe me, I appreciate the ability to submit feedback and request services online through the District’s website. I also understand the complexity involved in managing and responding to all of those requests—I’ve supported (and built) such systems myself. Having this experience, though, helps me also understand how important it is for you to help those requesting support and providing feedback to receive the information they need to know that the District has received, understands, and is working their request(s). Thank you for your consideration of my suggestions, above.